Inspired from a scene at Ghost Ranch where Georgia O’keefe lived near my home at the time in Santa Fe, New Mexico. 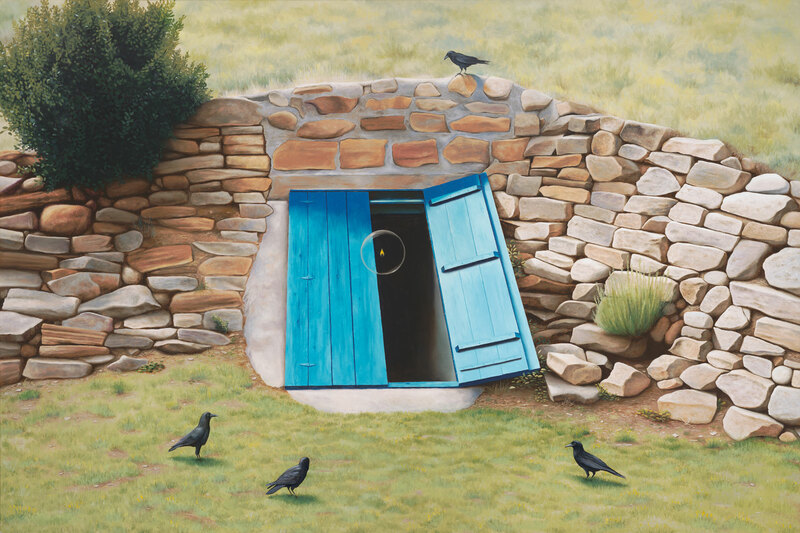 I saw this door leading into what was a root cellar for the old ranch house and found it a beautiful metaphor for what many of us will experience at some point in our lives: the dark night of the soul. Often initiated by a trauma or turmoil, it is a questioning of what we value most and who we are at the core. The globe with the flame in the center represents a human soul in its purest state. Here seen emerging from the dark night purified, delivered, enlightened. The ravens symbolize the shepherds of the unfolding mystery of human evolution. This is one of my most deeply personal paintings.